The standard 2015 One Pound Coin. Two versions of the one pound coins were released in 2015. Mintage: 29,580,000 (may include coins issued as part of a set). Minted at The Royal Mint. 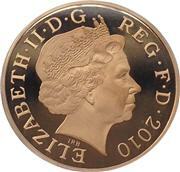 The 2015 One Pound Coin - Shield of the Royal Arms (a British one pound (£1) coin) is a denomination of the pound sterling. Its obverse bears the Latin engraving "Dei Gratia Regina" meaning, "By the grace of God, Queen" and FD meaning "Defender of the Faith." £1 - One Pound Coin - 2015 - Shield of the Royal Arms - Circulated. UK £1 COINS ROUND ONE POUND RARE COLLECTABLE LAST FEW REMAINING VERY GOOD CONDT.